If calling America a middle-class nation means anything, it means that we are a society in which most people live more or less the same kind of life. In 1970 we were that kind of society. Today we are not, and we become less like one with each passing year. Illustration: Tom CurryEver since the election of Ronald Reagan, right-wing radicals have insisted that they started a revolution in America. They are half right. If by a revolution we mean a change in politics, economics, and society that is so large as to transform the character of the nation, then there is indeed a revolution in progress. The radical right did not make this revolution, although it has done its best to help it along. If anything, we might say that the revolution created the new right. But whatever the cause, it has become urgent that we appreciate the depth and significance of this new American revolution—and try to stop it before it becomes irreversible. The consequences of the revolution are obvious in cities across the nation. Since I know the area well, let me take you on a walk down University Avenue in Palo Alto, California. If you tire of the shopping district and want to wander further afield, you might continue down University Avenue, past the houses with their well-tended lawns and flower beds—usually there are a couple of pickup trucks full of Hispanic gardeners in sight. But don’t wander too far. When University crosses Highway 101, it enters the grim environs of East Palo Alto. Though it has progressed in the past few years, as recently as 1992 East Palo Alto was the murder capital of the nation and had an unemployment rate hovering around 40 percent. Luckily, near the boundary, where there is a cluster of liquor stores and check-cashing outlets, you can find two or three police cruisers keeping an eye on the scene—and, not incidentally, serving as a thin blue line protecting the nice neighborhood behind them. Nor do you want to head down 101 to the south, to “Dilbert Country” with its ranks of low-rise apartments, the tenements of the modern prole tariat—the places from which hordes of lower-level white-collar workers drive to sit in their cubicles by day and to which they return to watch their VCRs by night. No. Better to head up into the hills. The “estates” brochure at Coldwell Banker real estate describes the mid-Peninsula as “an area of intense equestrian character,” and when you ascend to Woodside-Atherton, which the New York Times has recently called one of “America’s born-again Newports,” there are indeed plenty of horses, as well as some pretty imposing houses. If you look hard enough, you might catch a glimpse of one of the new $10 million-plus mansions that are going up in growing numbers. What few people realize is that this vast gap between the affluent few and the bulk of ordinary Americans is a relatively new fixture on our social landscape. People believe these scenes are nothing new, even that it is utopian to imagine it could be otherwise. But it has not always been thus—at least not to the same extent. I didn’t see Palo Alto in 1970, but longtime residents report that it was a mixed town in which not only executives and speculators but schoolteachers, mailmen, and sheet-metal workers could afford to live. At the time, I lived on Long Island, not far from the old Great Gatsby area on the North Shore. Few of the great mansions were still private homes then (who could afford the servants? ); they had been converted into junior colleges and nursing homes, or deeded to the state as historic monuments. Like Palo Alto, the towns contained a mix of occupations and education levels—no surprise, given that skilled blue-collar workers often made as much as, or more than, white-collar middle managers. You can confirm what your eyes see, in Palo Alto or in any American community, with dozens of statistics. The most straightforward are those on income shares supplied by the Bureau of the Census, whose statistics are among the most rigorously apolitical. In 1970, according to the bureau, the bottom 20 percent of US families received only 5.4 percent of the income, while the top 5 percent received 15.6 percent. By 1994, the bottom fifth had only 4.2 percent, while the top 5 percent had increased its share to 20.1 percent. That means that in 1994, the average income among the top 5 percent of families was more than 19 times that of the bottom 20 percent of families. In 1970, it had been only about 11.5 times as much. (Incidentally, while the change in distribution is most visible at the top and bottom, families in the middle have also lost: The income share of the middle 20 percent of families has fallen from 17.6 to 15.7 percent.) These are not abstract numbers. They are the statistical signature of a seismic shift in the character of our society. The American notion of what constitutes the middle class has always been a bit strange, because both people who are quite poor and those who are objectively way up the scale tend to think of themselves as being in the middle. But if calling America a middle-class nation means anything, it means that we are a society in which most people live more or less the same kind of life. In 1970 we were that kind of society. Today we are not, and we become less like one with each passing year. As politicians compete over who really stands for middle-class values, what the public should be asking them is, What middle class? How can we have common “middle-class” values if whole segments of society live in vastly different economic universes? If this election was really about what the candidates claim, it would be devoted to two questions: Why has America ceased to be a middle-class nation? And, more important, what can be done to make it a middle-class nation again? Most economists who study wages and income in the United States agree about the radical increase in inequality—only the hired guns of the right still try to claim it is a statistical illusion. But not all agree about why it has happened. Imports from low-wage countries—a popular villain—are part of the story, but only a fraction of it. The numbers just aren’t big enough. We invest billions in low-wage countries—but we invest trillions at home. What we spend on manufactured goods from the Third World represents just 2 percent of our income. Even if we shut out imports from low-wage countries (cutting off the only source of hope for the people who work in those factories), most estimates suggest it would raise the wages of low-skill workers here by only 1 or 2 percent. Information technology is a more plausible villain. Technological advance doesn’t always favor elite workers, but since 1970 there has been clear evidence of a general “skill bias” toward technological change. Companies began to replace low-skill workers with smaller numbers of high-skill ones, and they continue to do so even though low-skill workers have gotten cheaper and high-skill workers more expensive. These forces, while easily measurable, don’t fully explain the disparity between the haves and the have-nots. Globalization and technology may explain why a college degree makes more difference now than it did 20 years ago. But schoolteachers and corporate CEOs typically have about the same amount of formal education. Why, then, have teachers’ salaries remained flat while those of CEOs have increased fivefold? The impact of technology and of foreign trade do not answer why it is harder today for most people to make a living but easier for a few to make a killing. Something else is going on. In 1970 the CEO of a typical Fortune 500 corporation earned about 35 times as much as the average manufacturing employee. It would have been unthinkable to pay him 150 times the average, as is now common, and downright outrageous to do so while announcing mass layoffs and cutting the real earnings of many of the company’s workers, especially those who were paid the least to start with. So how did the unthinkable become first thinkable, then doable, and finally—if we believe the CEOs—unavoidable? The answer is that values changed—not the middle-class values politicians keep talking about, but the kind of values that helped to sustain the middle-class society we have lost. Twenty-five years ago, prosperous companies could have paid their janitors minimum wage and still could have found people to do the work. They didn’t, because it would have been bad for company morale. Then, as now, CEOs were in a position to arrange for very high salaries for themselves, whatever their performance, but corporate boards restrained such excesses, knowing that too great a disparity between the top man and the ordinary worker would cause problems. In short, though America was a society with large disparities between economic classes, it had an egalitarian ethic that limited those disparities. That ethic is gone. One reason for the change is a sort of herd behavior: When most companies hesitated to pay huge salaries at the top and minimum wage at the bottom, any company that did so would have stood out as an example of greed; when everyone does it, the stigma disappears. Those restraining forces have largely disappeared. The union movement is a shadow of its former self, lucky to hold its ground in a defensive battle now and then. The idea that a company would be punished by the government for paying its CEO too much and its workers too little is laughable today: since the election of Ronald Reagan the CEO would more likely be invited to a White House dinner. In brief, much of the polarization of American society can be explained in terms of power and politics. But why has the tide run so strongly in favor of the rich that it continues regardless of who is in the White House and who controls the Congress? The decline of the labor movement in the United States is both a major cause of growing inequality and an illustration of the larger process under way in our society. Unions now represent less than 12 percent of the private workforce, and their power has declined dramatically. In 1970 some 2.5 million workers participated in some form of labor stoppage; in 1993, fewer than 200,000 did. Because unions are rarely able or willing to strike, being a union member no longer carries much of a payoff in higher wages. There are a number of reasons for the decline of organized labor: the shift from manufacturing to services and from blue-collar to white-collar work, growing international competition, and deregulation. But these factors can’t explain the extent or the suddenness of labor’s decline. The best explanation seems to be that the union movement fell below critical mass. Unions are good for unions: In a nation with a powerful labor movement, workers have a sense of solidarity, one union can support another during a strike, and politicians take union interests seriously. America’s union movement just got too small, and it imploded. We should not idealize the unions. When they played a powerful role in America, they often did so to bad effect. Occasionally they were corrupt, often they extracted higher wages at the consumer’s expense, sometimes they opposed new technologies and enforced inefficient practices. But unions helped keep us a middle-class society—not only because they forced greater equality within companies, but because they provided a counterweight to the power of wealthy individuals and corporations. The loss of that counterweight is clearly bad for society. The point is that a major force that kept America a more or less unified society went into a tailspin. Our whole society is now well into a similar downward spiral, in which growing inequality creates the political and economic conditions that lead to even more inequality. Textbook political science predicts that in a two-party democracy like the United States, the parties will compete to serve the interests of the median voter—the voter in the middle, richer than half the voters but poorer than the other half. And since ordinary workers are more likely to lose their jobs than strike it rich, the interests of the median voter should include protecting the poor. You might expect, then, the public to demand that government work against the growing divide by taxing the rich more heavily and by increasing benefits for lower-paid workers and the unemployed. In fact, we have done just the opposite. Tax rates on the wealthy—even with Clinton’s modest increase of 1993—are far lower now than in the 1960s. We have allowed public schools and other services that are crucial for middle-income families to deteriorate. Despite the recent increase, the minimum wage has fallen steadily compared with both average wages and the cost of living. And programs for the poor have been savaged: Even before the recent bipartisan gutting of welfare, AFDC payments for a typical family had fallen by a third in real terms since the 1960s. The reason why government policy has reinforced rather than opposed this growing inequality is obvious: Well-off people have disproportionate political weight. They are more likely to vote—the median voter has a much higher income than the median family—and far more likely to provide the campaign contributions that are so essential in a TV age. The political center of gravity in this country is therefore not at the median family, with its annual income of $40,000, but way up the scale. With decreasing voter participation and with the decline both of unions and of traditional political machines, the focus of political attention is further up the income ladder than it has been for generations. So never mind what politicians say; political parties are competing to serve the interests of families near the 90th percentile or higher, families that mostly earn $100,000 or more per year. Because the poles of our society have become so much more unequal, the interests of this political elite diverge increasingly from those of the typical family. A family at the 95th percentile pays a lot more in taxes than a family at the 50th, but it does not receive a correspondingly higher benefit from public services, such as education. 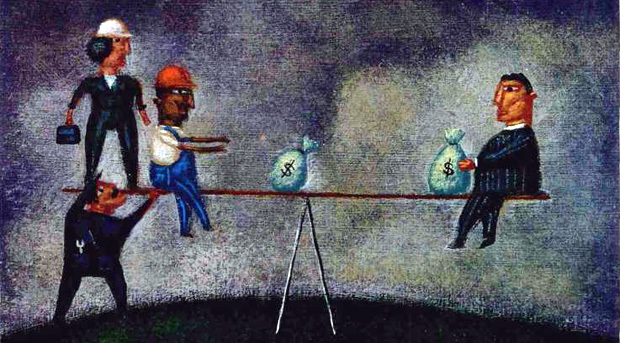 The greater the income gap, the greater the disparity in interests. This translates, because of the clout of the elite, into a constant pressure for lower taxes and reduced public services. Consider the issue of school vouchers. Many conservatives and even a few liberals are in favor of issuing educational vouchers and allowing parents to choose among competing schools. Let’s leave aside the question of what this might do to education and ask what its political implications might be. Initially, we might imagine, the government would prohibit parents from “topping up” vouchers to buy higher-priced education. But once the program was established, conservatives would insist such a restriction is unfair, maybe even unconstitutional, arguing that parents should have the freedom to spend their money as they wish. Thus, a voucher would become a ticket you could supplement freely. Upper-income families would realize that a reduction in the voucher is to their benefit: They will save more in lowered taxes than they will lose in a decreased education subsidy. So they will press to reduce public spending on education, leading to ever- deteriorating quality for those who cannot afford to spend extra. In the end, the quintessential American tradition of public education for all could collapse. School vouchers hold another potential that, doubtless, makes them attractive to the conservative elite: They offer a way to break the power of the American union movement in its last remaining stronghold, the public sector. Not by accident did Bob Dole, in his acceptance speech at the Republican National Convention, pause in his evocation of Norman Rockwell values to take a swipe at teachers’ unions. The leaders of the radical right want privatization of schools, of public sanitation—of anything else they can think of—because they know such privatization undermines what remaining opposition exists to their program. If public schools and other services are left to deteriorate, so will the skills and prospects of those who depend on them, reinforcing the growing inequality of incomes and creating an even greater disparity between the interests of the elite and those of the majority. Does this sound like America in the ’90s? Of course it does. And it doesn’t take much imagination to envision what our society will be like if this process continues for another 15 or 20 years. We know all about it from TV, movies, and bestselling novels. While politicians speak of recapturing the virtues of small-town America (which never really existed), the public—extrapolating from the trends it already sees—imagines a Blade Runner-style dystopia, in which a few people live in luxury while the majority grovel in Third World living standards. There is no purely economic reason why we cannot reduce inequality in America. If we were willing to spend even a few percent of national income on an enlarged version of the Earned Income Tax Credit, which supplements the earnings of low-wage workers, we could make a dramatic impact on both incomes and job opportunities for the poor and near-poor—bringing a greater number of Americans into the middle class. Nor is the money for such policies lacking: America is by far the least heavily taxed of Western nations and could easily find the resources to pay for a major expansion of programs aimed at limiting inequality. But of course neither party advanced such proposals during the electoral campaign. The Democrats sounded like Republicans, knowing that in a society with few counterweights to the power of money, any program that even hints at redistribution is political poison. It’s no surprise that Bill Clinton’s repudiation of his own tax increase took place in front of an audience of wealthy campaign contributors. In this political environment, what politician would talk of taxing the well-off to help the low-wage worker? And so, while the agenda of the GOP would surely accelerate the polarizing trend, even Democratic programs now amount only to a delaying action. To get back to the kind of society we had, we need to rebuild the institutions and values that made a middle-class nation possible. The relatively decent society we had a generation ago was largely the creation of a brief, crucial period in American history: the presidency of Franklin Roosevelt, during the New Deal and especially during the war. That created what economic historian Claudia Goldin called the Great Compression—an era in which a powerful government, reinforced by and in turn reinforcing a newly powerful labor movement, drastically narrowed the gap in income levels through taxes, benefits, minimum wages, and collective bargaining. In effect, Roosevelt created a new, middle-class America, which lasted for more than a generation. We have lost that America, and it will take another Roosevelt, and perhaps the moral equivalent of another war, to get it back. Until then, however, we can try to reverse some of the damage. To do so requires more than just supporting certain causes. It means thinking strategically—asking whether a policy is not only good in itself but how it will affect the political balance in the future. If a policy change promises to raise average income by a tenth of a percentage point, but will widen the wedge between the interests of the elite and those of the rest, it should be opposed. If a law reduces average income a bit but enhances the power of ordinary workers, it should be supported. In particular, we also need to apply strategic thinking to the union movement. Union leaders and liberal intellectuals often don’t like each other very much, and union victories are often of dubious value to the economy. Nonetheless, if you are worried about the cycle of polarization in this country, you should support policies that make unions stronger, and vociferously oppose those that weaken them. There are some stirrings of life in the union movement—a new, younger leadership with its roots in the service sector has replaced the manufacturing-based old guard, and has won a few political victories. They must be supported, almost regardless of the merits of their particular case. Unions are one of the few political counterweights to the power of wealth. Of course, even to talk about such things causes the right to accuse us of fomenting “class warfare.” They want us to believe we are all members of a broad, more or less homogeneous, middle class. But the notion of a middle-class nation was always a stretch. Unless we are prepared to fight the trend toward inequality, it will become a grim joke.